I have never been married, but I have attended countless wedding ceremonies as a guest. And sometimes not only as a guest, but in many other capacities. I have sung in choirs and I have been a soloist. I have been a reader. I have served as a bridesmaid as well as a maid of honor. (I have caught nearly every bouquet when one was thrown!) I have even catered numerous wedding celebrations. This weekend I added another experience to this parade of weddings. I officiated! Maybe because the special occasion is so fresh in my mind, but I have to say, this wedding is my favorite wedding I've ever been part of. My friends Randle and Jacob are big supporters of the All Good Things blog and the way I share observations and lessons. They know my voice and the way I express myself and asked for me to "All Good Things" their wedding and perform their ceremony! It was an honor and an incredibly special assignment. I was given complete freedom with my words. It was such a gift to speak to my heart's content on the subject of love and share my wishes for these dear men in my life. Shakespeare is first recorded using this phrase and he is believed to have coined it. 'Hearts content' is used in Henry VI, part II as well in The Merchant Of Venice. My favorite use is when he was dedicating the poem Venus and Adonis in a letter to the Earl of Southampton. "I leave it to your honourable survey, and your Honour to your heart's content; which I wish may always answer your own wish, and the world's hopeful expectation." During the ceremony, I led the guests in a guided meditation. We made wishes for Randle and Jacob in hopeful expectation of their happiness together. We wished for their hearts to be content as they officially begin their lives together. It was non-traditional and a risk I was taking— leading the hearts, minds, and breath of over a hundred people in the spirit of love. I'm overjoyed to report that it went over well and everyone played along. I won't share the meditation here, but I would like to invite all of you reading today to explore the contents of your heart and search for what makes your heart content – "which I wish may answer your own wish, and the world's hopeful expectation." More than the ceremony, I think my favorite part of the wedding weekend was being a component in a virtual stew of love. Not only are Randle and Jacob joining lives, they are also combining families. They are broadening their circle of friends to include all the loved ones of each other. I was able to finally meet relatives and friends of theirs that I've heard about for 26 years! 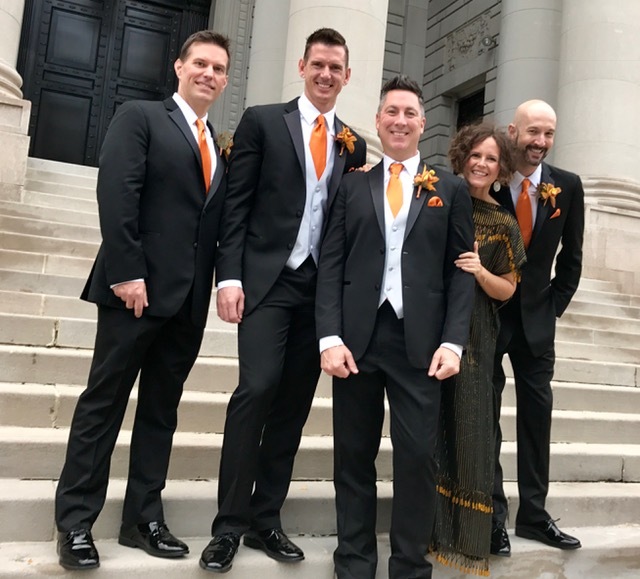 The wedding gave me the opportunity to spend time with some of my favorite people whom I wouldn't know if Randle and Jacob hadn't come into my life. We all had so much fun trading stories, laughing, dancing, dining, and celebrating the lives of these men we all love so much. It was like a big stew! Yes, I facilitated the event that brought us all together, but we were all very important ingredients in the stew of love that was their wedding weekend. I invite you all to break out your dutch oven, open up your favorite bottle of red wine, send a blessing to my friends and their life together, and make your own stew of love. Toss the carrots, and onions, 1 tablespoon of salt and 2 teaspoons of pepper in the fat in the pan and cook for 10 to 15 minutes, stirring occasionally until the onions are lightly browned. Add the garlic and cook for 1 more minute. Put the meat and bacon back into the pot with the juices. Add the bottle of wine plus enough beef broth to almost cover the meat. Add the tomato paste and thyme. Bring to a simmer, cover the pot with a tight-fitting lid and place it in the oven for about 1 1/4 hours or until the meat and vegetables are very tender when pierced with a fork. Combine 2 tablespoons of butter and the flour with a fork and stir into the stew. Add the frozen onions. Saute the mushrooms in 2 tablespoons of butter for 10 minutes until lightly browned and then add to the stew. Bring the stew to a boil on top of the stove, then lower the heat and simmer for 15 minutes. Season to taste. Spoon into bowls and serve with more thyme leaves sprinkled on top.